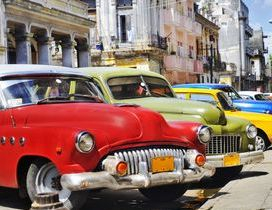 Experience Cuba’s gardens, World Heritage Sites and exuberant culture on this exciting tour. We will explore Havana including its historic and beautifully restored old city. Quintessential Cuban experiences such as taking a ride in a classic “Old Timer”, enjoying a Daquiri in an old Hemingway haunt and strolling through Havana’s streets filled with incredible architecture and wonderful sights will capture the spirit of this fascinating city. Havana is alive with art, music, dance, and friendly people. On our journey west, we will stay in the outstandingly beautiful Vinales Valley; a UNESCO biosphere. A hike into this dramatically serene valley includes visiting a tobacco farm and exploring the Indian Caves on foot and by boat. Our itinerary also takes us to the orchids of Soroa, the famous National Botanical Garden outside Havana, the eco village of Las Terrazas, and to Cuba’s ‘Pearl of the South’ Cienfuegos on the Caribbean coast. The crocodiles of Zapata and the colorful. beautifully preserved buildings of Trinidad will fill us with wonder and awe. We will also spend a relaxing afternoon on one of Cuba’s most beautiful beaches and experience some great evenings of entertainment. This tour has been carefully planned to give you a wonderful insight into Cuban life and culture. We do hope you choose to travel with us on this great tour! After transfer from Havana’s Jose Marti International Airport to our Hotel, you will have the opportunity to join our fantastic guide and wonderful driver on an afternoon of panoramic touring – including visits to some famous sights such as the Malacon, a former Hemingway hangout, and a rum museum. Our group dinner will be at a local restaurant. Following breakfast we will visit Havana’s well-known botanical garden for a private tour. In the afternoon and after lunch, we will travel to the stunning Vinales Valley and visit the Indian Caves carved into this gorgeous Karst landscape by millennia of water drainage. Our exploration will be on foot and by boat. Today we will hike into this serene landscape and visit a tobacco farm. We will be free in the town of Vinales to enjoy lunch independently before visiting a local private garden in the afternoon. Traditional Cuban pig roast dinner and fresh farm produce at a local organic farm tonight – a tour highlight. After breakfast we will travel to the gorgeous Soroa Orchid Garden for a guided tour. This botanical garden is situated in the beautiful Pinar del Rio mountains where exotic birds, butterflies and people enjoy the colorful and intriguing varieties of orchids in this lovely setting and well laid out garden. We will have lunch at one of the most popular restaurants in Las Terrazas – a popular and interesting eco village with artists workshops, lakes, mountains and where sustainable agriculture has successfully preserved the fragile local ecosystem– on our way back to Havana. Tonight we will have dinner and stay in the historic Hotel Nacional in Havana. Another visual feast of a day will be spent in Havana – a fascinating, vibrant and well preserved Spanish colonial city. It doesn’t take long to understand why Havana is a World Heritage Site and preservation of its dilapidated buildings is a priority. We will have a guided tour of the famous four squares in the Old City before our free afternoon of exploration. This will be your opportunity to visit some museums or just wander around the streets of Havana. Dinner will be at a popular local restaurant in Havana. Our journey to Cienfuegos, Cuba’s “Pearl of the South” will take us first of all the to Zapato National Park, the largest and most important wetland in the Caribbean. Here we will visit a crocodile farm and meet our first Cuban crocodile. Here, we will have lunch! In the afternoon we will continue to the Bay of Pigs and visit the museum on Playa Geron. This evening we will have dinner at our hotel. Our hotel is situated in such a beautiful spot with water on both sides and terrific views, so we are very pleased to be able to offer two nights here. Today, we will enjoy walking tours of two wonderfully preserved and historic cities, Cienfuegos and Trinidad. Trinidad is also a World Heritage Site and is renowned as having the best examples of Spanish Colonial Architecture in the Americas. Add some beautifully preserved and colorful classic cars, cobbled streets and friendly locals, and you won’t stop taking pictures. Our city tour will include a visit to Bar La Canchanchara and the Palacio de Cantero Museum. We will lunch in a local restaurant before spending the afternoon at the Playa Ancon where you will have time to relax, swim or snorkel before heading back to our hotel. You are free this evening to visit a local restaurant for dinner. After breakfast we will head back to Havana via Cojimar, a picturesque fishing village where Hemingway docked his boat El Pilar. Not only did he use the town as a base for fishing, Cojimar was the background for one of his most famous works, The Old Man and the Sea. The ‘old man’ in the title is reputedly his guide Gregorio Fuentes, a Cojimar local. We will lunch in Las Terrazas Restaurant before visiting the Vivero Organiponico in Alamar – one of Havana’s largest and most successful urban gardens. The rest of the afternoon is your’s to enjoy back in Havana. Tonight we will eat at the famous El Aljibe chicken restaurant. After breakfast you will be transferred to the airport for your onward journey. Please email us at [email protected] , we are happy to discuss booking a tour or designing a custom tour for your group!